Hand-color engraving after Benjamin Franklin Smith, Jr.
Dimensions: 49 1/2" x 34"
This impressive view, painted by Benjamin Franklin, Jr. from the Latting Observatory, gives a fascinating glimpse of mid-19th century New York. Perhaps the most striking aspect of this splendid view is the lack of development in this area, now among the most busy centers of commerce in Manhattan, then almost at the northern end of the populous zones of the city. 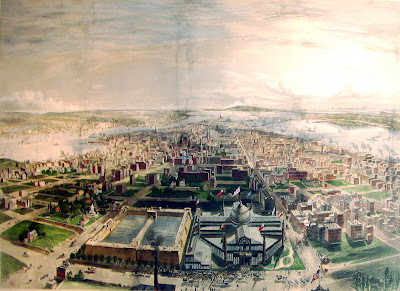 In the immediate foreground is 42nd Street, then the Croton Reservoir, which was built in 1839-42 and demolished at the turn of the century to make way for the New York Public library. The spectacular Crystal Palace, which adjoins the Croton Reservoir, was the centerpiece of the 1853 World’s Fair. Occupying on the site of the present-day Bryant Park, it was destroyed by fire in the late 1850’s. To the direct north were the stately mansions of Fifth Avenue and further north was Harlem, which was practically another city in the nineteenth century. The Latting Observatory, from which this view was taken, was built in 1852 for the World’s Fair, and it was too burned to the ground in 1858. Constructed from timber braced with iron, it stood near the northwest corner of 5th Avenue and 42nd Street, and was over 300 feet high - probably the highest edifice erected in America at the time. The Observatory was of special fascination for New Yorkers, for it had a steam elevator providing access to the first and second landings, where telescopes were provided to allow the most encompassing views of the city. The view receded in deep perspective to include both the East River and Hudson River, Brooklyn, Staten Island, and New Jersey. This splendid view gives a glimpse of the city’s former monuments and is a rare and valuable document of its exponential growth over the last 150 years.